Karl & Team - The final result is much better than the old door so we're pleased with the Fitter's work. He was polite and cleaned up really well. We are delighted with the workmanship and found the two fitters helpful, courteous and unobtrusive. We will be glad to use you again and to recommend you to our friends and acquaintances. I just wanted to say we are both really pleased with the windows and doors. I can't even tell that there used to be a different frame there, it's amazing! It is a fantastic job and Chris and Luke were both a pleasure to have in our house so thanks very much to both you and them. Please accept my thanks as Andrew has been fantastic today with the door frame. He presents himself very well, being very polite and friendly, which isn't something that you come across a lot of nowadays so is a real credit to your business. Just a quick email to let you know that we are very happy with the install of our back door. The two men who installed it did a fantastic job, were very quick, polite and left everything tidy. I would recommend you to anyone, and if we need more work doing, you'll be the first person I call. We just wanted to say thank you for an outstanding job from start to finish. 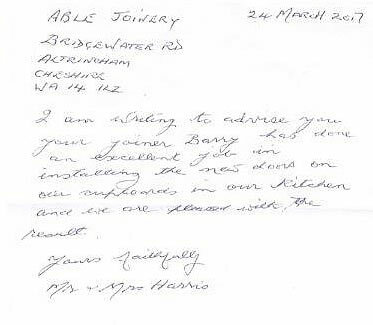 As this was our third job you have completed at our home in Timperley, although the biggest, it was a real pleasure to work with you all. I would certainly recommend your company to friends and family. Hoping you go from strength to strength. A quick thanks to you and your team for a great job replacing the window frame and renovating the stained glass window. Josh has done a great job, thanks very much. Andrew did an excellent job fitting our new window which we are very pleased with. I can confirm that we were very happy with the window repair work, which was carried out to an excellent standard. Can I also say that your employee, Steve, is a credit to your organisation. He was both hard-working and polite, and the site was left spotless with no evidence that he had ever been. It was also apparent that he was completely trustworthy, and I had no qualms at all about leaving him at the house while I went out to work. Thank you for doing a fantastic job and providing such a warm and professional service. We are delighted with our new windows. I’d like to say thanks for the work, it’s absolutely what I wanted and the chap (embarrassed to say I’ve forgotten his name) who was here was a delight to have on site! He was quiet, methodical, friendly, patient and very tidy. I got to observe him problem solving one of the doors and I gained a lot of confidence in his skills watching him test and check his work until he was satisfied it was right. Thank you very much - the service as always has been excellent and the finished result looks fabulous. Can't wait to feel the benefit of the warmer rooms and for now just cracking on with the relatively minor bits of redecoration. We're really pleased with everything from start to finish of the job. Maybe one day we'll get the front door done too! I just wanted to let you know how pleased we are with the job carried out by Andy and Mark (new panels in the conservatory roof and replacement window panel). They were extremely polite and courteous and worked well and we are delighted with the outcome. The Conservatory now looks exactly as we wanted it to. In addition the way everything was dealt with from start to finish has been first class and I will not hesitate from recommending Able Joinery. Just wanted to thank you and the team at Able Joinery for a great job fitting our new door and porch cupboard. We are so pleased with it. Steve did a great job, he worked really hard and gave us exactly what we wanted. He also ensured the place was clean and tidy before he left each day. If you need a testimonial for your website we would be more than happy to provide one. I just wanted to let you know how delighted my wife and I are with the work your team did on our windows. It really is a first class job, and they were very clean and tidy. Please pass on our thanks. We're hoping to invite you back some time next year to carry out the same work on the dining room window bay (below the bedroom) and the hall. The installers efficient, kind & helpful. A delight to have in the house. I am exceptionally pleased with the job and this was the second occasion the firm had installed double glazing and other work. I have been delighted with the work carried out. We are delighted with the job, enjoying having lots of fresh air again! We found Stephen trustworthy & extremely tidy. Karl was friendly, prompt & answered all our questions. His detailed quotation & supporting information was better than his competitors & was a deciding factor in choosing Able Joinery. We would definitely recommend Able Joinery to friends & family. Karl was very friendly and helpful, great, reliable, polite installer Andy and great work. Pleased with the job thanks. I'm already an existing customer and will be again soon! From Karl's original visit, to Andy's completed installation - all first class, very pleased with the job and have already recommended you. Karl was very smiley, professional & on time. Andy the installer very good & didn't drink too much tea! Very pleased with the job. Andy and Conner did an excellent job. I was away for most of the time they were here but they completed the fitting quickly and neatly. They were polite, helpful and cleaned everything up afterwards. The door works beautifully. Everyone in the family is opening and closing it just to experience the contrast with what we had been putting up with for years with the old door! Thank you for completing the job so quickly and providing such good value. Bernadette and myself are really pleased with the uPVC doors that were fitted on Tuesday. Andy and his assistant were efficient, tidy and very polite. Based on our experience, we would recommend you to friends and family. Just a note to thank you for the work you have done - no problems found so far anyway - and a special thank you to Stephen. He was terrific - punctual, tidy, self-contained, he just got on with the job, professional and talented. Everything we could have hoped for. Keep hold of him! The work looks really good. Just a quick note to say how pleased we are with the new windows. They have made a big difference to the house as you can imagine. Steve and his helpers did a great job! He is a true craftsman! Many thanks for everything. We will. of course. be recommending you to our friends. I just wanted to drop a quick email to pass on my compliments to everyone at Able Joinery. The two gentlemen that came out to Whalley Range to fit my new pane of glass this morning were friendly, extremely quick and the quality of the job was great, much better than I had expected. Everyone I have spoken to in the office when enquiring and receiving quotes have also been extremely helpful. I will definitely be recommending Able Joinery to friends who I know are in the middle of house moving and coming back if needed in the future. Just a quickie......very many thanks for the 'paint job' - the door looks really good now. As usual your guys have done a great job and we are delighted with the overall effect of our new doors. Of course we will continue to recommend Able Joinery to any interested parties. Sorry it has taken so long to get round to sending this email, but I just wanted to drop a note to say thank you once again for a great job done by Able on our doors & porch. Andy & Andy did a superb job on the fitting and we are delighted with the finished look which has transformed the front of the house. Thanks also for your assistance in getting the measurements right and helping us choose the correct options which has contributed to the finished look which we are so happy with. As last time there was no mess left and it was like they had never been at the house at the end of each day. Thanks again and if we have any future joinery needs we know where to come. I hope you are well. I just wanted to send you a note to say how pleased we are with our lovely new door - it looks great. The fitters who came out were really good and with your help the whole service was really quick and straightforward. The only problem now is the rest of the house needs tidying up to match the swanky new door - I think Andy will be kept busy for a while! I just viewed the finished window now and it looks fantastic, really pleased with the job, thank you. The guys fitting it were excellent and very professional. Many thanks for your efficient service. I would like to complement you on the pleasant and efficient way that your staff performed their work. They left the site in impeccable condition. Thank you very much for making our house new again. Andy and his apprentice Shaun did an excellent job in installing our new double-glazing windows and door. Our house now looks beautiful both from inside and outside. Could you please pass on my sincere thanks to them? Please also pass on my thanks to Kim, for her kindness, for writing to me and for sending me the fair trading information. Thank you for taking up our order promptly and for fitting my tight schedule. For all this, I am grateful! Thank you for the Fensa details and for the guarantee which arrived today. You can certainly show my email as you said to prospective customers. I wish you and your business every success. Not only that you provide good service, but more crucially, you are good people and trustworthy. Just a small note to thank you and your team for a job well done at our place. The door looks fantastic and modifications to the kitchen are truly well done. Congratulations. No doubt I shall refer to to you for any possible further jobs I might have. With apologies that it's taken several weeks to write to you, I wanted to pass on our thanks to you, Wayne and the team. The windows and front door look great both inside and out, and we've had admiring remarks from the neighbours! The guys were efficient and tidy, and nothing was too much trouble. We're delighted with the end result and will happily recommend you to everyone. Please pass on our thanks for a great job well done. Both my wife and I were delighted not only by the friendliness and professionalism of your onsite glazing replacement team, but also by the speed at which you provided a competitive and transparent quote, and the ease of booking and arranging payment for the work. Our damaged double glazing is now fully restored thanks to your efforts. Thank you. First of all I hope I have spelt your name correctly, if not apologies. I would just like to pass on our thanks for a job very well-done, we are both delighted with the work done by Able Joinery last week at our house. Everything looks better that we expected it to and this is down to the quality of the items you supplied and also the excellent workmanship of the fitters who visited us, please pass on our thanks to all concerned. I would also hope that some of the lager/beer founds its way to yourself, it was meant for everyone involved and that you enjoyed a drink on us over the hot week-end! Best regards and thanks again, we have your number if anyone asks us for a future recommendation for a joinery company. Many thanks, the quality of the workmanship has been absolutely superb. The customer service of your company has been exceptional and we would recommend you to anyone.